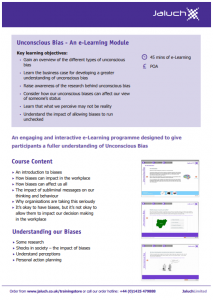 We are excited to offer an engaging and interactive unconscious bias eLearning programme designed to give participants a fuller understanding of the topic. Using examples and interactive exercises the course takes a straightforward look at one of the most important current issues in diversity management. We are subject matter experts and have the key specialist knowledge on unconscious bias training. This unconscious bias programme takes around 50 minutes to complete. Learners can start and stop the course as they please and their place will be saved. A certificate can be provided upon completion. If you would like a longer programme then please contact us. Customisations range from simple branding – logo replacement and re-colouring the template to match your branding, to a full bespoke package where we can tailor the course to your organisation’s exact requirements by adding/removing certain topics, changing learning objectives, focusing on one specific bias that you wish to address or incorporating links to your policies and procedures. This content can be delivered through our own e-learning platform in instant online access format for individual or multiple users, which we can manage for you. If you would prefer, corporate licences for unlimited users within your organisation are also available (SCORM download for use with in-house learning Management Systems). "A really interesting course. Everyone needs to have their unconscious bias tapped into to recognise it, heighten awareness and increase their understanding in the work and social environment." "I can highly recommend the services of Jaluch. Their commitment and professionalism has helped us greatly with a diversity of employment issues, their support and assistance has proved invaluable." We also run interactive and practical Unconscious Bias Workshops and offer blended learning solutions if you need both eLearning and classroom training for more information on these contact us.